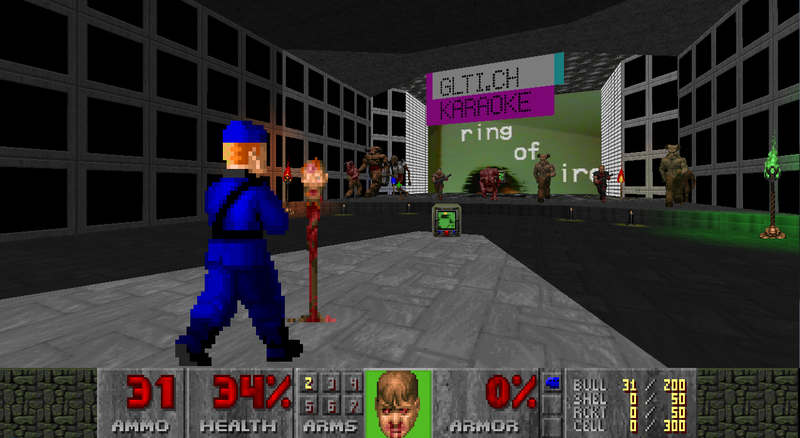 GLTI.CH Karaoke » Tactical Glitches: Doom WAN Party! Visit the gallery on opening night (January 24th) for a round of GLTI.CH Breaks, followed by a month-long Doom WAN Party in the gallery space! What is a GLTI.CH WAN Party? We’ve kludged together free software, dusty hardware, and technical loopholes to rock a global deathmatch Doom WAN party that celebrates, in GLTI.CH style, 20 years of Doom LAN parties. Computer stations installed at SUDLAB in Naples are connected to a remote laptop server in London and a turn-of-the-millenium PC in Seoul, inviting network errors through the front door and rendering gameplay inefficiently possible. Your keyboard movements and rocket launching in the SUDLAB gallery space may not just warm up, but explode computers and servers located across the world! Frienemies can also join in the rusty chainsaw action via the TACTICALGLITCH Doomseeker server. See you at SUDLAB or ONLINE very soon.